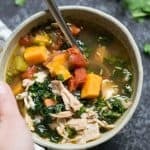 This chicken kale soup is a great way to overcome the post-thanksgiving feeling of “oh… I’ve had enough roast turkey for an entire year.” Instead of force-feeding yourself turkey for a week, substitute it in this soup for the chicken! Sweet memories that are associated with a particular food can dramatically increase how much we enjoy that food! I’m convinced that half the reason we enjoy cake is because we have such great memories of friends gathering to celebrate birthdays. Half the reason we love traditional Thanksgiving food so much is because it reminds us of good times with family. Note that I did say half the reason. Cake IS cake, after all! 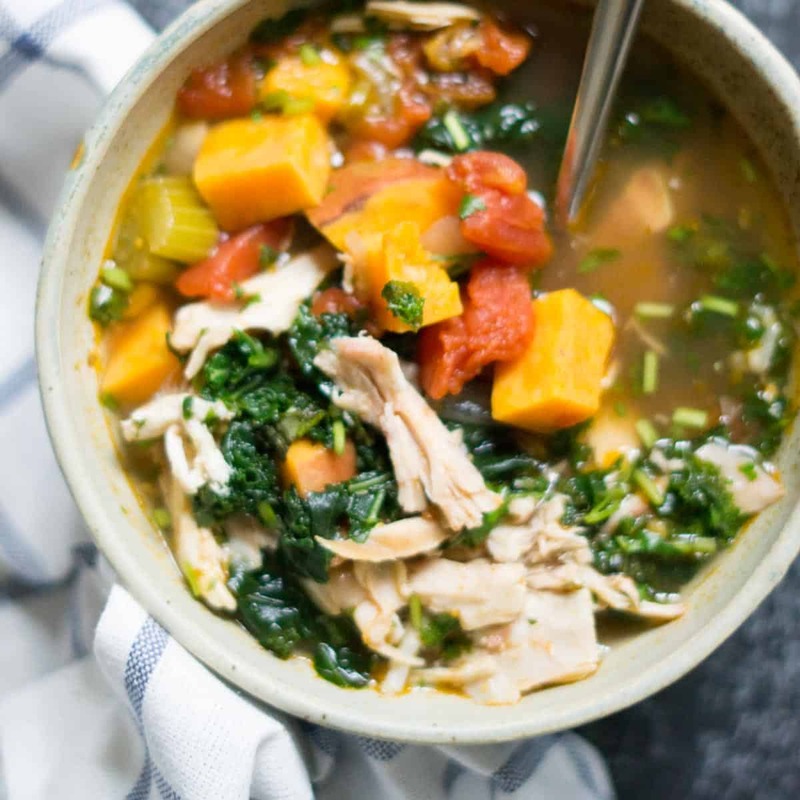 When our second son was born, friends of ours brought us an amazing chicken kale soup with sweet potato. That first week or two after bringing a baby home are some of my most cherished memories. After a long 9 months of waiting to meet the little one, after an arduous time actually birthing the little one, you finally get to hold and snuggle your sweet baby. Then there are all those birth endorphins that just cocoon you into a blissful state. After our first son was born, a friend brought us a balsamic chicken dinner… I actually strongly DISLIKED the taste of balsamic until then! But now it has become one of my favourites! I have this theory that we should serve more foods that score well on the nourishing scale at parties and celebrations, in order to create these really good memories associated with food. Why do we need to associate popcorn with movies? Bring on the carrot sticks! Birthday parties? Hello apple slices! Thanksgiving? Chicken kale soup here we come! I’m not saying that we should abandon the popcorn, cake, and pumpkin pie altogether. But I think we can make room at the table and in our memories to boost our enjoyment of these more healthful foods. Anyhow, for months after we brought our son home from the hospital, I lay awake dreaming about the soup that our friends had brought us. So, of course, I had to re-create it! Post-Thanksgiving Chicken Kale Soup Tradition? I’m a self-proclaimed RECOVERED picky eater. 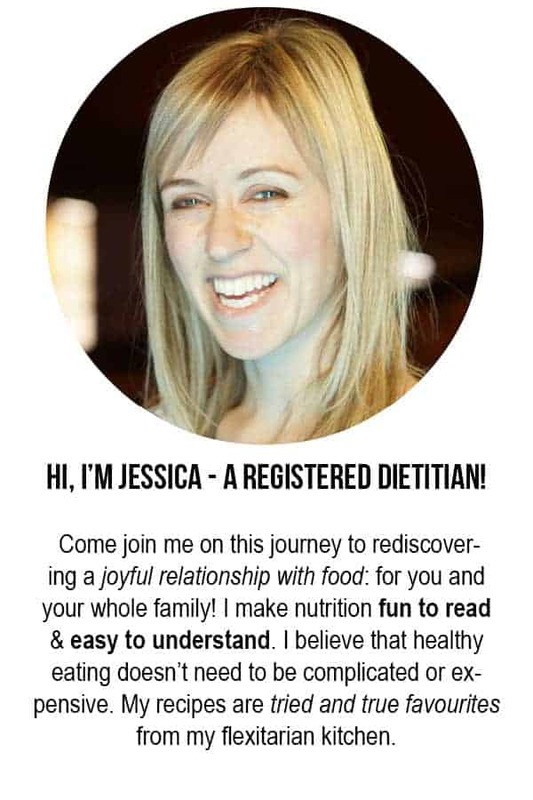 I was one of those kids who preferred the “white diet”… you know what I’m talking about: bread, pasta, and pancakes were kind of all I wanted to eat! Okay, my picky eating wasn’t that extreme, but there were very few cooked veggies I enjoyed. As I started to reform my eating I discovered the absolute BEST way to eat veggies: in soup form! 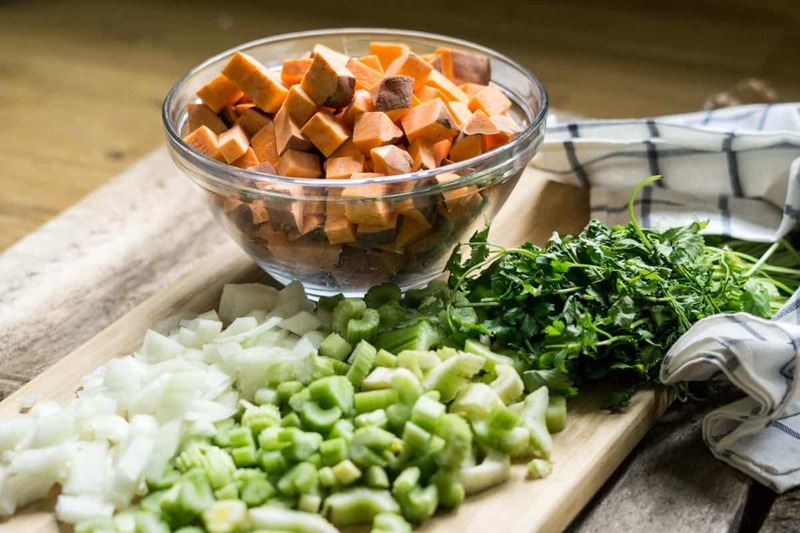 Initially I discovered that if I made soup and blended it up, I wouldn’t taste the individual veggies but rather whatever other spices and herbs I had added in. Although I’ve learned to love veggies in nearly any and every way now (and you can too! ), soup still remains one of my favourite ways to eat a bunch of veggies all at once. 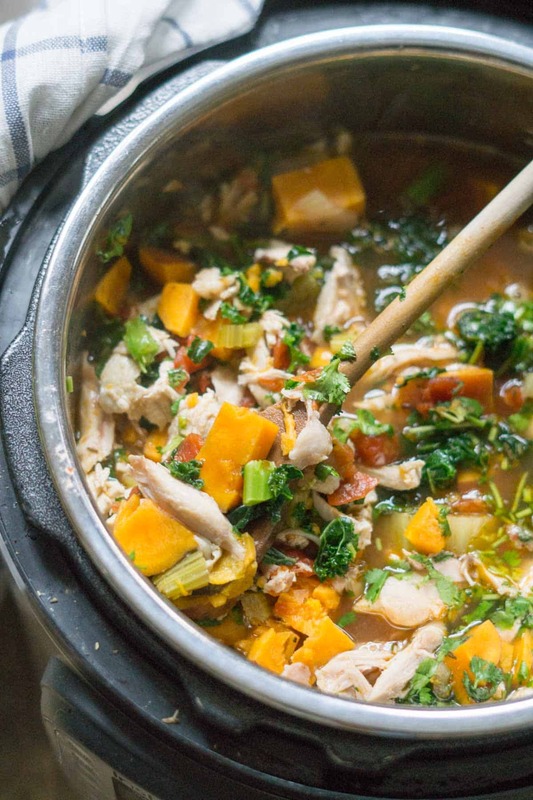 And this chicken kale soup is especially veggie-potent. It has 4.5 servings in each bowl! Not only that, it has 21.5g of protein and 6g of fibre. This soup will keep you feeling full for aaaggges! 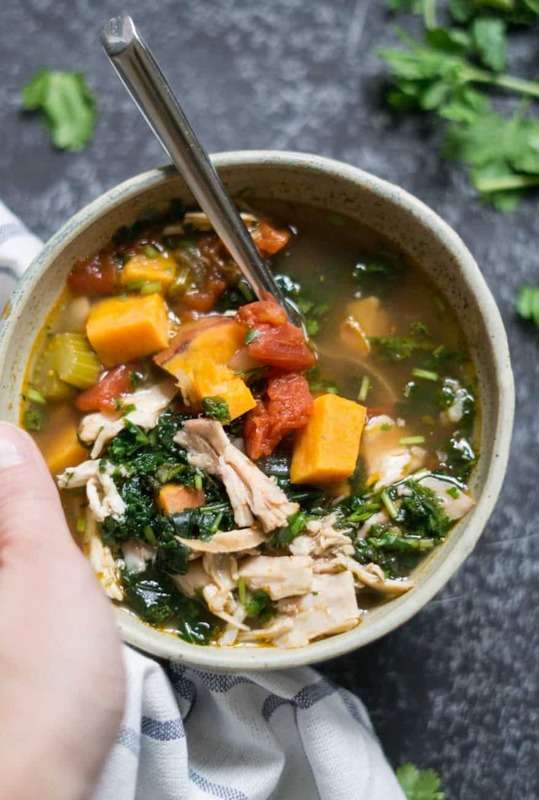 Love this chicken kale soup and want more delicious soup recipes? Place the oil, onion, and celery in the pot of the Instant Pot. Press “saute” and cook and stir until the onions are soft and start to turn brown. The saute setting is pretty hot so you need to stir frequently to prevent burning. Meanwhile, dice the sweet potato. Once the onions are ready, add the garlic, oregano, and cumin. Saute and stir for one minute. Add in the diced sweet potato and can of diced tomatoes. Meanwhile, dice the cooked chicken. I like to buy a rotisserie chicken from Costco and use this. You can also use leftover Thanksgiving turkey or cook up a few chicken breasts or thighs. Roughly chop the cilantro and kale. Boil the water in a kettle. This isn’t actually necessary but it speeds up the soup making and aren’t we using an Instant Pot to make meal prep go faster? Measure the water and stir in the bouillon paste and salt. Once the Instant Pot is done cooking, cover the vent with a tea towel and turn the vent to “venting.” Releasing the pressure will take about 1-2 minutes. Open the lid and add in the diced chicken, kale, cilantro, and bouillon/water mix. Set to “saute” and heat until hot enough to eat! Kale, spinach, or swiss chard can be used. 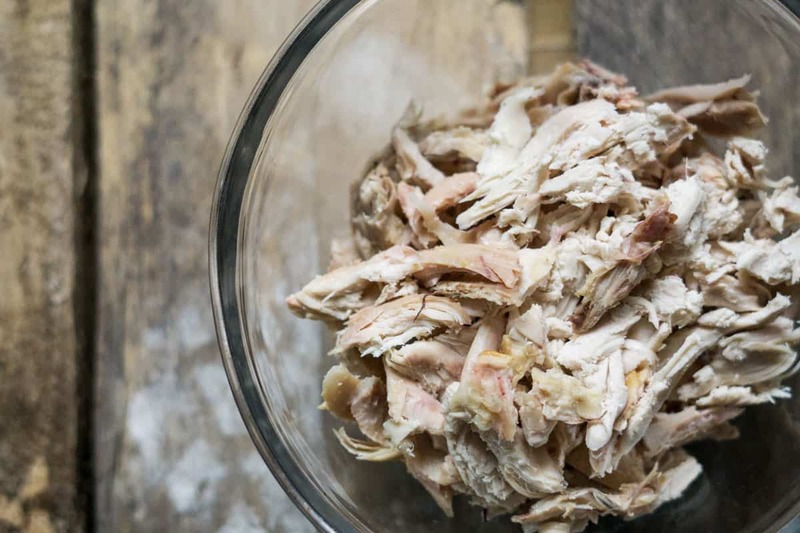 Leftover Thanksgiving turkey or rotisserie chicken works great! I’m going to try this it sounds delicious. Not sure what you mean by 1 head of celery? One celery stick? I wasn’t quite sure how to explain it but I meant a whole bunch! So I updated the recipe and wrote “8 stalks of celery” instead. I unfortunately don’t own an insta pot. Could I still make this somehow? For sure! Do the sauteeing in a large pot and then add the rest of the ingredients (except cilantro) and cook over medium until the potatoes are cooked. Then add the cilantro and serve! Yay! Thanks for submitting a review!